You might know them as “substitutes,” “floaters,” or “seasonal staff,” but when it comes to filling in, these short-term workers all fall within the pro re nata (PRN) category. Literally translated to “as needed,” PRN employees help established companies keep their businesses running. If you're in need of extra cash but have limited availability during the week or on weekends, finding a PRN position could be the perfect solution. Flexible scheduling. PRN employees fill in when full-time employees are unavailable or in need of extra help, particularly during holiday seasons and times of increased productivity. Because you're not a regular employee, you'll have a more flexible schedule when it comes to choosing shift times. You might even have the option to choose which department you'll work for or the tasks you're interested in completing. Higher pay. Like freelancers, PRN employees don’t receive benefits or dedicated office space, which usually means that they can charge a higher rate than their full-time counterparts. On-call or retainer status. Depending on their needs, some companies offer PRN employees on-call or retainer status during their busy months. This means that you’ll be paid to be available, regardless of whether you’re actually called into work. Who Works as a PRN Employee? Registered Nurses (RNs). Per diem RNs earn $76,710 per year, according to Glassdoor, and some take home much more. Earlier this year, a per diem RN working in the San Francisco Bay Area made headlines when he posted a photo of his pay stub, in which he earned just over $19,000 for 32 hours of work. Check out Nurse.org for information about healthcare shortages in the U.S. to learn where your expertise will pay off the most. Child care workers. Daycare teachers earn $10.33 per hour, according to PayScale, and floater teachers earn slightly less at $9 per hour. 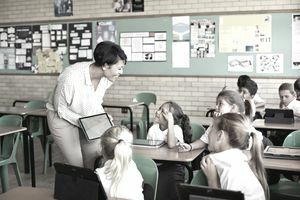 One way to potentially increase your pay is to join a temp agency that connects qualified caregivers with schools. They may be able to negotiate higher rates on your behalf. Substitute teachers. Temp teachers earn an average of $100 to $125 per day, or $75 to $80 per day without certification, according to the National Education Association. These figures work out to an hourly range of 10.71 to $17.85 per hour, depending on your qualifications, for a seven-hour school day. Unfortunately, this rate is significantly less than a full-time teacher’s hourly rate of $38.46. If your schedule allows, consider looking for temp-to-hire teaching positions that would allow you to work toward a higher earning position. Retail/seasonal staffers. The average retail sales associate earns just over $11 per hour according to Payscale, and temp employees are likely to earn about the same. That said, some retailers pay more during seasonal rushes, including Nordstrom, which lists an hourly rate of $12.35 to $13.35 on an Indeed listing. Restaurant and catering roles. PRN restaurant and catering staff are likely to earn the same wages as their full-time counterparts with one caveat: tips. If you sign on to work during busy tourist or holiday seasons, it usually means bigger tips due to increased traffic. So, while the full-timers' salaries will ebb and flow throughout the year, working in the food industry at certain times can help you maximize your hourly rate. Administrative assistance professionals, i.e., “temps.” Salary.com lists an administrative assistant's hourly rate at $20, but a freelance pro can earn much more. Sites like Upwork and Remote.co regularly post administrative and virtual assistant gigs, and you'll have the opportunity to set your own rates based on your skillset. The bottom line: Working is a PRN employee isn't always preferable to full-time benefits, but it's the perfect opportunity if your schedule needs flexibility. Consider your skills and think about how to parlay them into a profitable PRN side hustle.